The demolition of a huge Turkish statue devoted to reconciliation with Armenia has begun, months after the prime minister described it as a "freak". 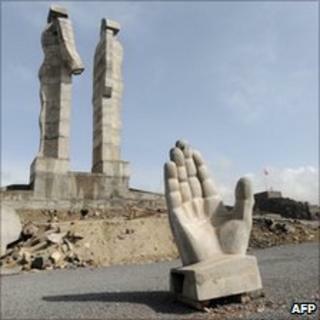 The 30m-high statue - depicting two human figures facing each other - was erected on a mountain in the Turkish city of Kars, near the Armenian border. Local authorities commissioned it several years ago to symbolise an end to decades of enmity and suspicion. Artists had tried to save the statue, which could take 10 days to dismantle. The company carrying out the demolition has already cut down one of the figures using a crane, witnesses said. The work, called the Statue of Humanity, was the creation of well-known Turkish artist Mehmet Aksoy. When finished, it would have had one figure extending a hand to the other. "I am really sorry, sorry on behalf of Turkey," Anatolia news agency quoted the sculptor as saying. "They can demolish it, we will re-make it." It was commissioned as a gesture of reconciliation, as Turkey and Armenia began attempts to repair relations after a century of hostility. But that process stalled last year and there were a number of objections to the monument. On a visit to Kars in January Prime Minister Recep Tayyip Erdogan reportedly described the monument as a "freak", and an affront to a nearby 11th Century shrine. Critics say Mr Erdogan may have aimed his remarks at nationalists, who are strong in this part of Turkey, ahead of June's parliamentary elections. Kars once had a large Armenian community, which was annihilated in 1915 as part of mass killings which Armenians and many historians call a genocide. Turkey rejects the term and says atrocities were committed on both sides in World War I. In 2009 the two countries agreed to normalise relations and, in that spirit, the former mayor of Kars commissioned the sculpture. Leo Varadkar and Jeremy Corbyn are among those to arrive at St Anne's Cathedral in Belfast.